Rosnani Jamil is a producer, director, actor and scriptwriter at 70. DATIN Rosnani Jamil and Abdol Azez Satta are two fine examples of how “age does not matter”. Rosnani, owner of ManjaFilms Sdn Bhd, is a producer, director, actor and scriptwriter at 70 and occasionally goes to Hard Rock Café to listen to music. Looking 10 years younger than their ages, Abdol Azez and Rosnani were among the guests at a Media Seminar on Active and Productive Ageing held in Kota Baru in December. Abdol Azez, better known as Aziz Satar, acted in the recent Pontianak Harum Sundal Malam 1 and 2 and also in Pendekar Bujang Lapok, the 1959 classic awardwinning comedy alongside Tan Sri P. Ramlee and S. Shamsuddin. 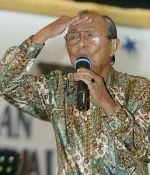 Rosnani won the Seniwati Sepanjang Zaman award at the 16th Malaysian Film Festival in 2003. 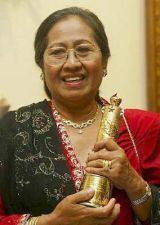 She also directed her own movies in the 1980s that included Mawar Merah, Antara Dua Hati and Amelia. Rosnani admitted that even her own children do not really approve of her remaining active at work. Some of them have asked her to stay home instead and help look after the grandchildren.